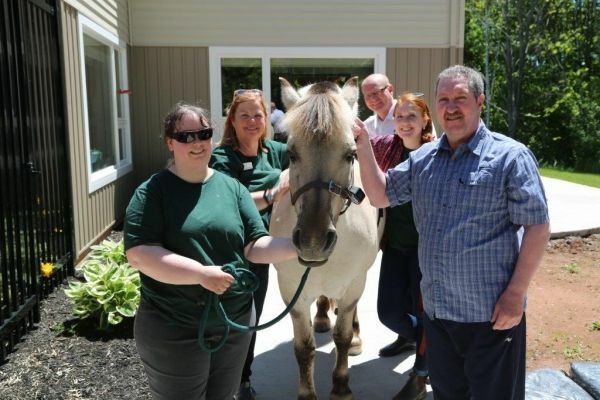 It’s not usual to see a horse in the parking lot of the PEI Provincial Palliative Care Centre—except when Billy, the Norwegian Fjord horse, comes to visit. Sixteen-year-old Billy is owned by Dr. Mary McNiven, professor of animal science at the Atlantic Veterinary College (AVC). For over three years, she has been bringing Billy to visit patients in the Centre. He interacts with the patients who want to visit with him at their windows, in the parking lot, or in the courtyard. Because of the way the Centre is designed, they can see him from their beds, and the windows can be opened so they can talk to him and his handlers. Charlottetown resident Kerry McKenna, a 58-year-old day patient at the Centre, loves to visit with Billy. McKenna was diagnosed with cancer in 2013 and has been coming to the Centre two days a week ever since.